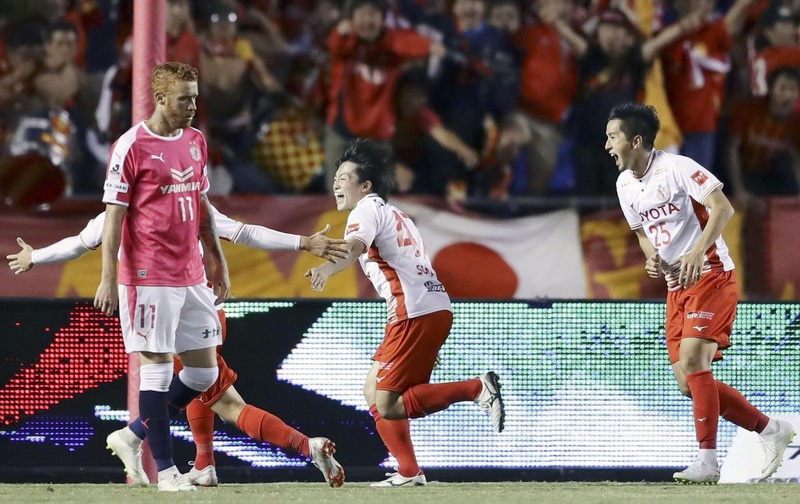 OSAKA - Yuki Soma’s first career goal secured Nagoya Grampus a badly needed 1-0 win at Cerezo Osaka on on Tuesday. 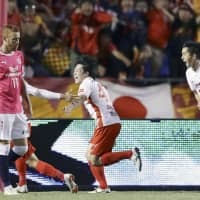 Grampus’ first win in three games lifted them into 15th place in the first division, one point clear of the drop zone. At the other end of the table, the Kashima Antlers won 3-2 at Kashiwa Reysol to move up to third on 52 points, one ahead of Consadole Sapporo, who host Urawa Reds on Saturday. Soma, who made his J. League debut on Aug. 11, had come off the bench six times before making his first start at Kincho Stadium. Poised in the middle of the penalty area in the 53rd minute, Soma was in the right place at the right time. Cerezo goalkeeper Kim Jin-hyeon punched the ball his way and Soma headed it back into the goal. “I may have scored the goal but the win was the result of 90 minutes of hard work and hard running by the entire team,” said the 21-year-old Soma after his first career start and goal. “I didn’t cause that goal, but recently I’ve been consciously trying to push forward into the penalty area to be in a position to score, and I think that played a part. “I’ve been trying to rise to the level of play and trying to contribute, so I’m thrilled to be able to score,” he added. After a frustrating first half in which both teams had trouble getting the ball past midfield and the few opportunities that resulted were rushed, the visitors came into the second half playing with much more poise. Yosuke Akiyama’s cross, intended for J1 scoring leader Jo in front of goal set up Grampus’ score. Kim got between Jo and the ball but was helpless when it came flying back past him. Grampus ‘keeper Mitchell Langerak nearly gave the lead away when he scooped up a back pass. The gaffe gave Cerezo a free kick within the penalty area that was blocked by the wall. The Australian then inflicted some unintended damage on forward Kenyu Sugimoto when he punched away a cross and elbowed the striker in the face. A few minutes later, the hosts were gifted another close-range free kick from an Eduardo Netto handball, but Souza’s shot whizzed over both the wall and the bar. In Kashiwa, Kazuma Yamaguchi’s 61st-minute goal broke a 2-2 deadlock for the Antlers, who were resting many of their first-choice players ahead of Saturday’s second leg of the AFC Champions League final. The Antlers carry a 2-0 lead to Tehran after beating Iranian club Persepolis last Saturday in Kashima. Reysol’s loss left them on a collision course with the second division, buried in 17th place, four points from safety with just two games remaining.